Suzi Godson » Antidate. The antidote to dating apps. Antidate. The antidote to dating apps. Hatty Kingsley-Miller and Mo Saha are the brains behind Antidate, an app which allows women to see and message men who are online near them, but like a one-way mirror, it doesn’t allow men to see, or message, women who have not expressed a direct interest in them. It means that women can date without having to worry about receiving a barrage of emails from opportunists and time wasters, and guys don’t waste time on women who are not interested in them. The girls based the project on their own frustrations with dating sites like Tinder and Grindr, so it includes features such as time stamped profile pictures. 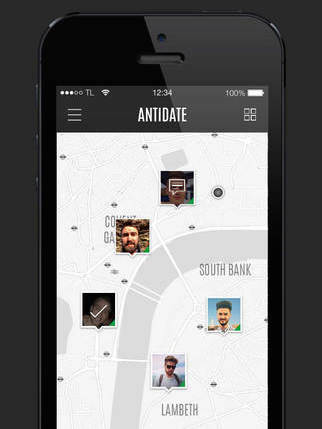 Antidate also links up with your Instagram account for additional pictures. Because the site only shows men who are nearby, exchanged messages can quickly convert to a face to face meeting. This means people can see whether there is any real chemistry, sooner rather than later. So far the app, which only launched before Christmas, has about 700 users who are mainly based in London, and initial data suggests that about 80 percent of women who initiate a conversation get a reply. Hatty and Mo are now looking for investors to help them expand to other countries.